JoAnn Chaney, author of dark debut What You Don't Know, shares some of her favourite crime-busting teams in fiction. Neither man laughs. This is normal banter for these two, who spent the span of the first season of True Detective insulting and hurting and fighting each other, but still, after everything, managed to work together, to make their partnership a good one. I was writing my first draft of What You Don’t Know when I binged my way through True Detective, and I can remember turning off the TV after the last episode and sitting in silence, as if I’d been stunned. If you’re a writer, you’ll understand—that feeling of seeing something great, compelling and honest and wonderful that helps inspire your own storytelling. I came away from those episodes with my head buzzing, full of ideas about what I could do with the characters in my book, who’d all started to seem stale and flat. To be perfectly clear: this essay is not meant to be a sloppy, starry-eyed love-fest dedicated to True Detective. But that show did help drive a point home in my writing: the characters I was creating, shaping with my words and bringing to life, they needed to seem real. And Rust and Marty were real to me. Believable. Guys I know, guys you know. Guys who cheat on their wives, who drink, who swear and fight and lie. They’re real as individual characters, and maybe even more importantly, real in their interactions with each other, in their partnership. So I started on my book again, reworking my two cops from the ground up. My detectives are Hoskins and Loren, who’ve been thrown together for another case, despite the fact that they are so different, they don’t get along, that their relationship is often prickly and insulting and violent, and they have their own methods and motivations which usually take them in opposite directions. But that’s the way a true partnership should be, in both reality and fiction: it’s opposites that attract, and if you had the opportunity to marry yourself you’d probably die of boredom in the first twenty-four. Rust and Marty are only the latest in a long line of fictional, crime-fighting, mystery-solving teams who’ve inspired my writing with their relationships. There are plenty of others, of course — Sherlock and Watson; Nancy Drew and her girlfriends; Cagney and Lacey; Tubbs and Crockett from Miami Vice; Harry Potter and his best friends Ron and Hermione. And let’s not forget Mulder and Scully of The X-Files, who are complete opposites in most every way, including in their hunt for the truth involving UFOs and other paranormal phenomena, but still manage to work together as a team despite their disagreements—there’s nothing better than a bout of snarky, heated dialogue between the man who wants to believe and the woman who believes nothing. But partners in crime aren’t always cops. There’s Clarice Starling and Hannibal Lecter of Silence of the Lambs, who helped me see that two characters can be working toward a common goal while both having their own agendas simmering on the backburner, and even garner a mutual respect for each other in the end. It is all of these characters I kept in mind as I wrote my novel—I wanted to two very different men working together, who thought and behaved in opposite ways, who both despised and cared for each other. Because that’s life. People don’t get along, it’s friction that creates heat that makes things interesting. There’s a moment in the finale of True Detective’s first season when the two main characters are alone outside a hospital, standing under the night sky as ambulance sirens howl in the distance. 'I brought you something,' Marty says. He hands his partner a box as he looks in the opposite direction, embarrassed. 'We getting engaged?' Rust asks. Rust opens the box. Inside is a pack of cigarettes, and he smiles. These are two men who’ve been through hell and back, and have come out with a stronger partnership because of it. 'You remembered', Rust says, nodding. He seems pleased. 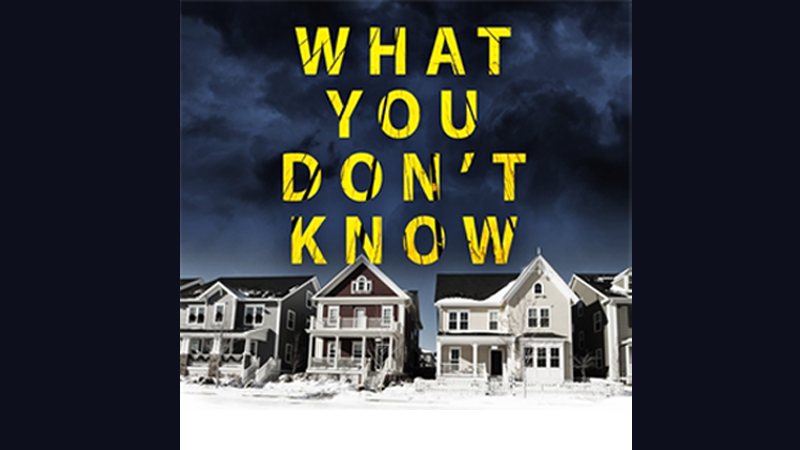 JoAnn Chaney's What You Don't Know is out now in hardback, ebook and audio. Seven years ago, Detective Paul Hoskins and his larger-than-life partner solved one of the biggest serial killer cases of the decade. They dug up 31 bodies in a crawlspace belonging to the beloved Jacky Seever, a pillar of the community and a successful businessman. Sammie Peterson was the lead reporter on the case. Her byline was on the front page of the newspaper every day. Seever's wife, Gloria, claimed to be as surprised as everyone else. But when you get that close to a killer, can you really just move on?